A2 Yeoman Gate, Yeoman Way, Worthing, Sussex BN13 3QZ. I must admit that, on occasion, my heart has sunk when I have seen books featuring something such as greatest or, say, one hundred. Tests, players etc. Doubtless very worthy subjects, in many cases excellent books but it is usually an opinion and don’t many of us have an opinion? We might agree with some choices and disagree with others. Before I started on Real International Cricket A History in One Hundred Scorecards, I wondered whether this might be along the same lines as the above. Not a bit of it and any doubts which I may have erroneously taken from the title were soon dispelled by this fascinating book. What we have within one of Pitch Publishing’s latest books is a history – as the title states in one hundred scorecards – of non-Test-playing nations ranging from the ones currently in the public conscience, Afghanistan and Ireland, to those who many may not even know play the game including Romania and Hungary. It’s not just men either with the women from, amongst others, Singapore and Malaysia making the cut. The dates range from 1840 to the present day so is quite a labour of love on the part of Roy Morgan. 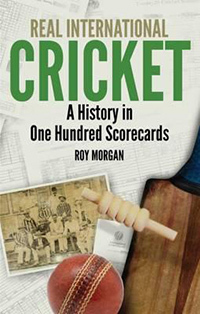 A write-up and scorecard accompanies each of the hundred selected matches and includes a few curiosities along the way. The book expertly covers matches not just chronologically but discusses the changes and attitudes through the eras. The shift in lengths of matches appears and, although Timeless Tests do not form part of non-Test countries, the Twenty20 shortest format most certainly does. Lest the reader think that all the teams mentioned comprise the majority of countries playing cricket, an appendix towards the end of the book shows exactly how many – and more – have participated as Associates and Affiliates. It shows the vast geographical area of countries which play and have participated around the world. The sources used showing many newspapers consulted is, in itself, fascinating. Some countries/principalities are mentioned: if I was unaware until recently that Iceland played football, I was aware of one cricket ground lurking in Reykjavik and other places where the game is played include Andorra and Vatican City. There is very much to recommend Real International Cricket and I am sure that many readers will learn so much more about some of the outposts where the game has been and is still enjoyed.